Photo of Bing Crosby and his daughter Mary displaying a marlin caught in Baja California in the late 1960s by Douglas Kirkland. 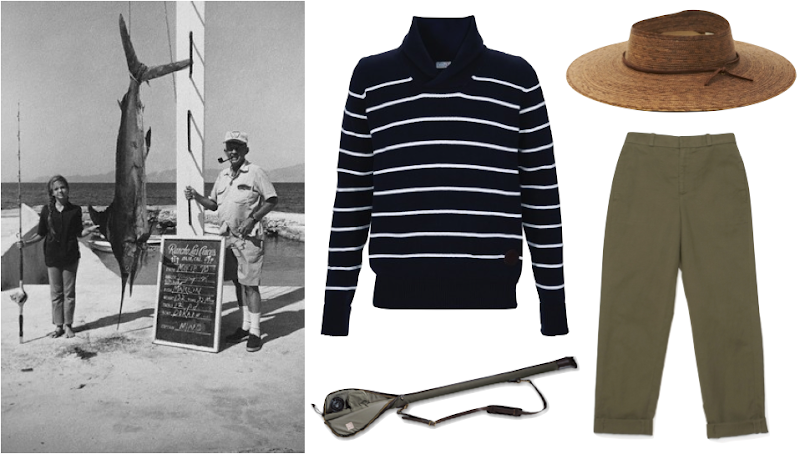 Barbour Alliance Men's Shawl ($204); Open Crown Hat ($34); James Pant by Steven Alan ($169); Rod Case. I love that striped sweater! Great sweater. Great photo as well. Oh the sight of this outfit made me gasp for joy! That Barbour sweater makes me want to be British yesterday. . . check out my blog if you have time! the hat is linking to steven alan. is that where its from? for $34? I love this ooutfit so nice so sweet so simply and so elegant!! !